Overall Goal – To reduce the risk of extinction of the vaquita through education and community awareness, and learn more about the species’ population status though field research. Other Goals – To support Mexico’s recovery plan for reducing the risk of extinction of the vaquita through our work. 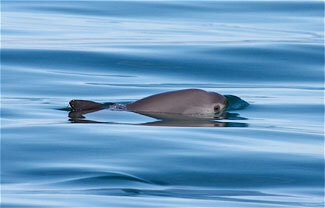 During the study when vaquitas are observed, basic sighting data are collected, and we attempt to obtain photos. Individual vaquitas are identified from examination of the photos, and we are building-up a catalog of known individuals and their sighting histories, to learn more about the species’ life history, movements, social organization, and health status. We search for vaquitas while the vessel is moving, but also periodically conduct ‘stop and drift’ searches, in which the vessel’s engine is shut down, and 3-6 observers search the area with naked eye and 7Xand 10X binoculars for 45-60 minutes. To develop a long-term photo-identification catalog of vaquitas, by adding new individuals and by collecting resightings of individuals first identified in 2008. To better understand life history, social organization, movements and individual habitat requirements through identification of individual vaquitas. To evaluate the feasibility of investigating the occurrence of dermal disease, nutritional condition, and anthropogenic injuries in the population. To evaluate the feasibility of using mark-recapture techniques to estimate population size with photo-identification data. To conduct school outreach programs to educate children and teachers in southern/central California and Baja California, Mexico, about the plight of the vaquita. To give public lectures and slideshows to further educate the general public about the critically endangered status of the vaquita and inspire people to save the species. To develop an international ‘Adopt-a-Porpoise’ program to assist in fund-raising efforts for vaquita conservation. To develop an ‘e-library’ of popular and scientific literature on the vaquita for further educating people about the vaquita’s biology and plight. To photo-document the substantial ecotourism resources of the upper Gulf of California, and thereby help to develop alternative income sources for gillnet fishermen.